A collection of outfits actually worn in-game by my Blood Elf Death Knight. Outfits are listed from most recent to least recent. Items that are no longer obtainable are marked with an asterisk (*). Some of the outfits in this collection are legitimate Transmogrification kits for a plate-wearing character. 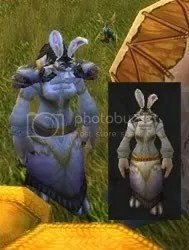 Others are RP-Clothes costumes intended to imitate the look of the blue-haired Kirin Tor-affiliated elves found in various locations. I’m not sure if these NPCs are actually supposed to be High Elves that have become blue-haired because of their exposure to arcane energy, or blue dragons in humanoid form. At any rate, the only way to achieve that appearance as a player character is to be a Blood Elf Death Knight. I was feeling like I might have drawn the well of inspiration for Love is in the Air kits featuring the Bloodscale Belt dry, but Kandrista insisted that she needed a Bloodscale Belt outfit, too. I’d kind of been wanting to try using the deep maroon of the stage 2 Truesteel items in a Bloodscale Belt kit. I think this works rather well. 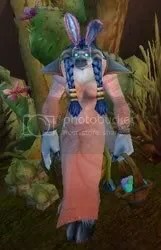 This outfit would also look magnificent on a Night Elf, Nightborne, or Void Elf Warrior. I know, I know, Purple Judgment is so cliche for a Death Knight. She’s not wearing it because she’s trying to be a Dark Paladin or somesuch nonsense, though. She’s wearing it because it’s a purple robe and she’s trying to be a Mage or somesuch nonsense 😉 The blue accessories help with that, don’t they? 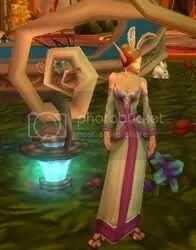 Minipost x2: Kaelinda gets a Legion Legendary; Flower Circlets!!! It’s even a class and spec-specific item, not just a generic all-around utility item! That’s my third Legion Legendary item (as player, not character), and so far, I’ve gotten all three of them from Suramar Emissary caches. 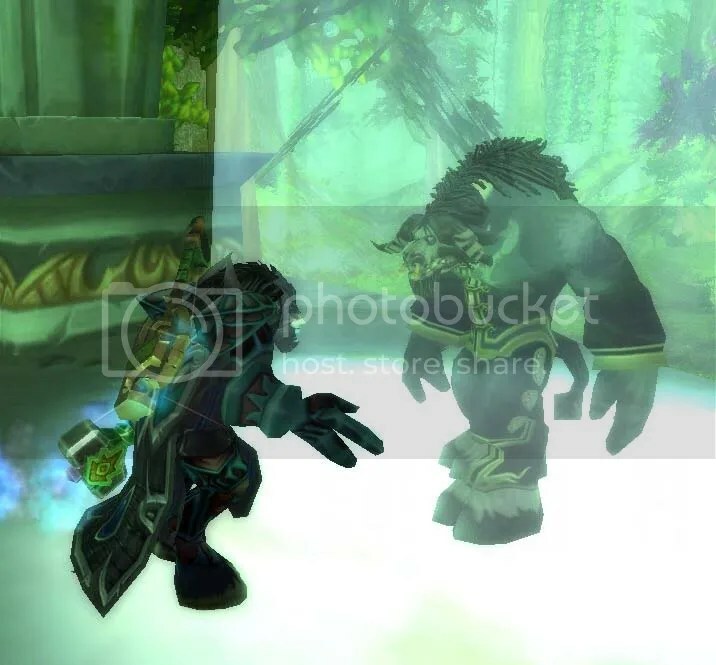 Lookie what’s coming in Patch 7.3! Squeeeeee!!!!! I have wanted a flower circlet headpiece for a long time. I wonder how we’ll get them? I hope it’s not something ridiculously complicated like the pink hippogryph and all that other secret stuff in Legion so far. 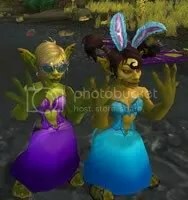 They’d be appropriate for a holiday such as Love is in the Air or Noblegarden, but I’d like to be able to Mog with them year-round, so I hope they’re not associated with one of those holidays. 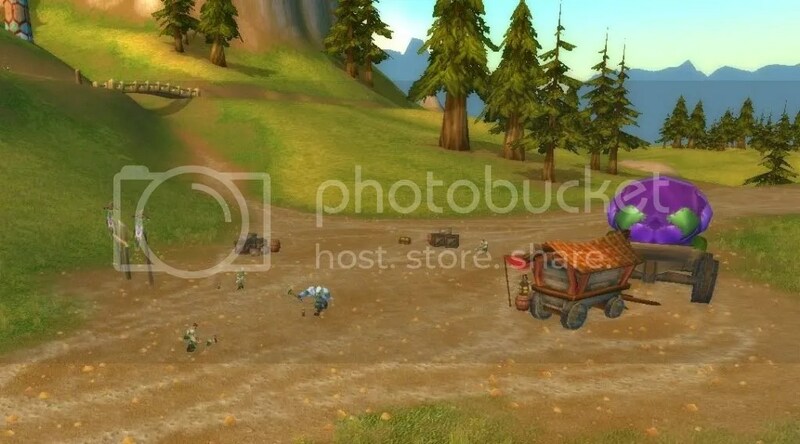 Maybe the Darkmoon Faire? That would be a good venue for this sort of thing to be a new reward. 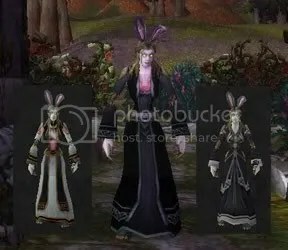 Between administrating the GBNEH3, collecting 20 eggs a day with each of sixteen alts (in the first half of the week, dropping off to just seven by the end of the week), and Mog Madness, I didn’t manage to do anything fashion-related during Noblegarden itself this year. So I’m doing it now, a bit belatedly — but before Children’s Week, at least! 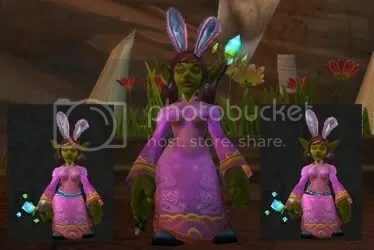 Because the Spring Circlets themselves cannot be used as transmogrification templates, these outfits are not Transmogrification-friendly — they are purely for RP use. 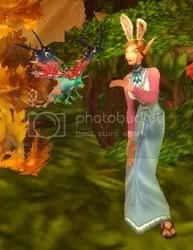 Lovely Blue Dress + Pink Mageweave Shirt; maybe we’ll get the Kezan partygoer’s Blue Bunny circlet in another few years? 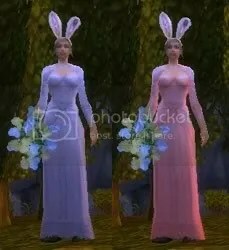 I would really love to have a light pink version of the Councillor’s Sash to wear with the Spring Circlets! 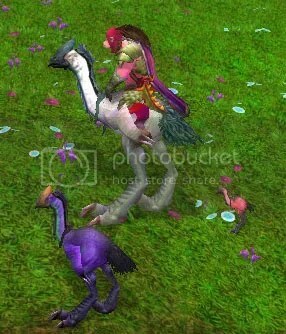 I didn’t really dig the three pink tallstriders thing during Love is in the Air. Or, at any rate, I didn’t dig it enough to want to compete for Lovely Charms as a level 82 character against raid-geared level 85 characters on a PvP server (I didn’t even do my Argent Tournament dailies during that holiday, because my quest mobs were too popular of a charm-farming spot), nor did I dig it enough to want to stalk and tame Mazzranache. But the idea of three differently colored tallstriders, that I rather liked. 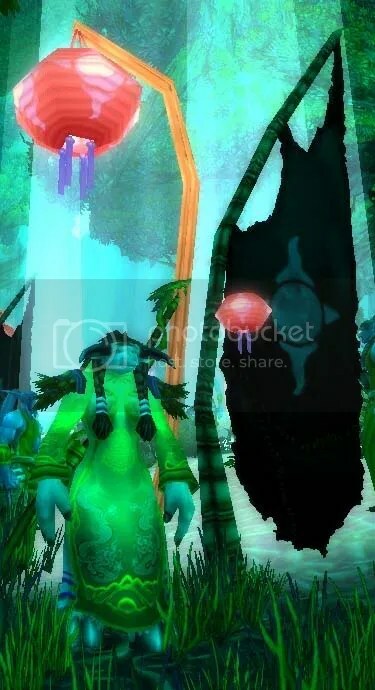 So Ketura stayed at the Argent Tournament until she could get the Mulgore Hatchling, as well as her Darkspear Raptor mounts. 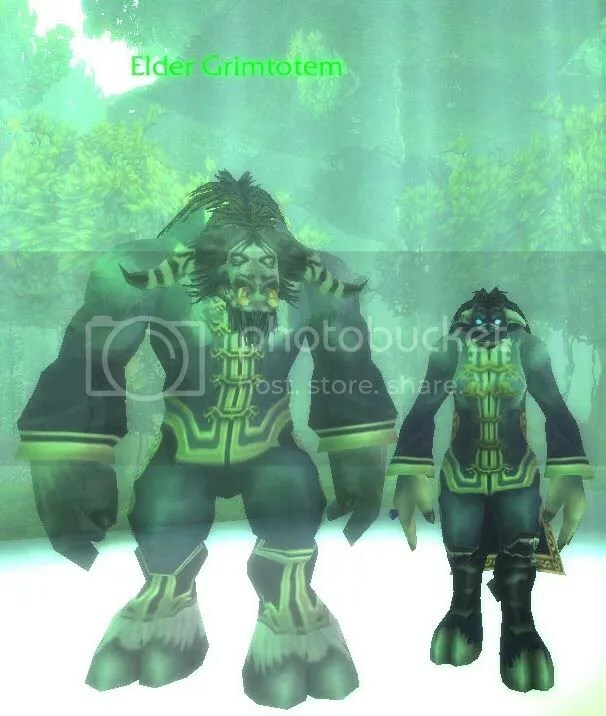 She’d already gone out and tamed a Lost Torranche to mimic a level 1 Tauren Hunter’s pet (she herself began adventuring long before Hunters got pets at level 1). 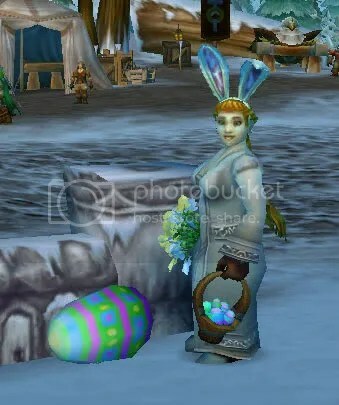 During Noblegarden, she collected 100 chocolates every day, starting on Monday, and got her Springstrider on Friday. Together, they are quite a Noblegarden-ish flock of birds indeed! I was anxious to finish doing Lunar Festival stuff this week because next week there is a triple holiday threat of Lunar Festival + Love is In the Air + Darkmoon Faire. 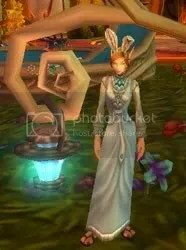 I intend to focus on the Darkmoon Faire and ignore Love is In the Air until the second week of that holiday. It would be easier at this point to list the characters I haven’t collected Coins of Ancestry with than those I have. First all the new-since-last-year alts wanted their 5 coins for their one piece of party clothes. Then all my Mages reminded me that when I’d only gotten them one piece of Lunar Finery last year, I’d promised them that I’d get them a second piece (of whichever type they didn’t get last year) this year. Then KatelyraKeriluna wanted as many coins as she could easily collect, to bank toward a Lantern next year. Then I decided I ought to get a Lantern on at least one toon, and so off Kaelinda went. Pink Festival Dress, Orchid Amice, Hood of the Arcane Path, Kimbra Boots. The Kimbra Boots were a quest reward from old Loch Modan that Kay picked up last year during her jaunt on the Alliance side, and are no longer available in game. I am not sure if the Orchid Amice is still available, either. Then Kelisanna also wanted as many coins as she could easily collect, just for the XP. I need to take that girl to LFD sometime so that I actually learn how to use all her Rogue abilities. Then I couldn’t resist the lure of relatively painless guild XP, and collected all the coins I could easily get with each and every one of my Tauren alts in my banking guild. Collecting coins with level 81 Ketura and level 85 Kregga really piled on the guild XP — between the two of them, they generated 11% of the daily guild XP cap and 5% of the overall XP needed to get to guild level 2 — the most guild XP I’ve gotten in one day for a long time! And that was just getting the coins that were easy. 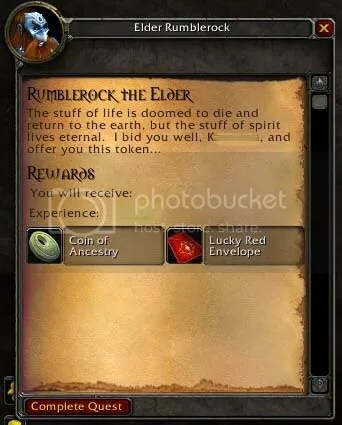 I skipped the coins in Alliance starting zones & capital cities, I skipped Astranaar because NPCs are too close to the Elder and my reflexes aren’t fast enough to complete the quest before the spawned Sentinel one-shots me (I’m sure Alliance characters have the same trouble with the Crossroads and Vendetta Point), I skipped all the dungeon coins except Zul’Farrak because that one is really easy to get to. Because they could, both Ketura and Kregga bought Festival Lanterns. Ketura gave hers to Kaiuna, and Kregga used the Booty Bay AH to exchange her Festival Lantern for a Lunar Lantern, which she then gave to Kerisa. 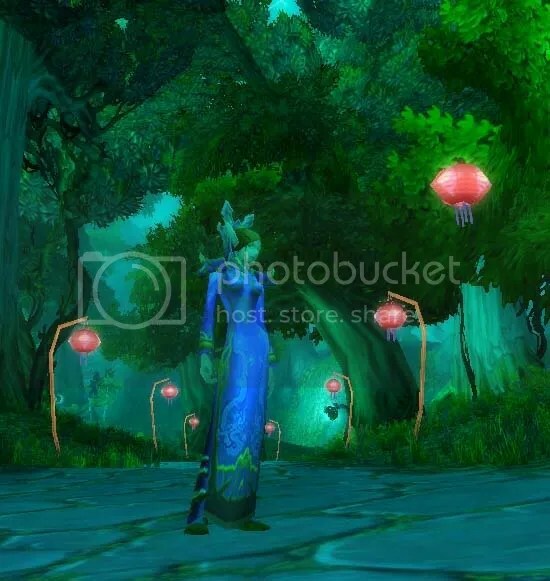 It seemed to me that my Druids would be the Tauren toons most likely to want Lunar Festival Lanterns. Needless to say, I have spent a LOT of time in flight, either on flight paths or on a flying mount, over the past couple of weeks. My system has this annoying behavior where if I am alt-tabbed during a loading screen or when a flight path lands, I get disconnected. Because I can’t alt-tab while I’m on flight paths, I had to find something not-on-the-computer to do while I was waiting. Luckily, I had a project already to hand. One of my sisters gave me a pillowcase embroidery kit for Christmas. I’d already finished the first of the pair, but I still had the second to do. After I finished the second pillowcase, I occupied myself with sewing the wings for another stuffed toy whelpling. Embroidery/hand-sewing and lots of time in flight go very well together!